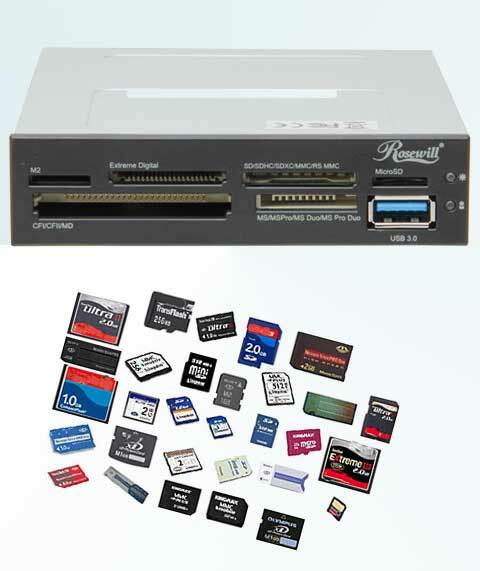 The Rosewill RDCR-11003 is an ideal solution for hi-speed data transfer between your computer and flash media cards. It fits your PC’s 3.5” internal drive bay. It has five memory card slots and one slot which requires adapter. Up to 74 different types of memory cards are supported. It also features a SuperSpeed USB 3.0 port to deliver a blistering fast data transfer speed between your PC and your USB-enabled devices. Transfer large amounts of data in seconds, and say goodbye to long waiting times.